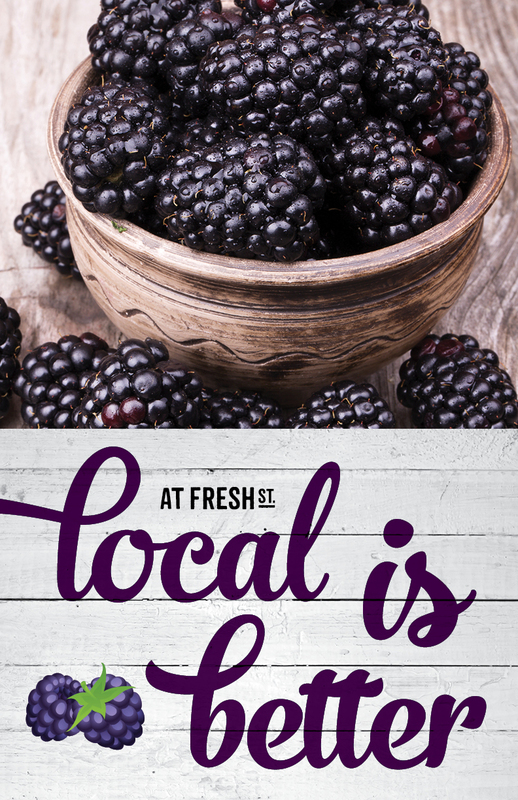 Here at Fresh St. we're hoping you're fully stocked up with berries following our Salmon and Berry Festival. Among the tasty treats, grills and fun that invaded our Fresh St. Market and Fresh St. Farms locations in North Vancouver and Surrey were the brightest, freshest variety of berries this side of the Pacific. Not only did the festival replenish our appetites but it gave us a taste of local food grown right in our beautiful province. British Columbian berries are full of punch and flavour, it's hard to choose which recipes to grace them with. Sure, blueberries are a favourite baked into Sunday morning pancakes and their brethren, raspberries, are a great topper to a mint mojito...but why be so vanilla (pun intended)? Summer eats are all about vivid colours and fresh ingredients. This salad is as fresh as it gets with pops of sweet, salty and sour flavours. - In a large bowl, combine baby spinach, strawberries, blueberries and pecans. - Coat with a vinaigrette. - Sprinkle crumbled goat cheese over top and serve. British Columbians love their sockeye salmon. They also love their fresh B.C. berries. Now imagine the two together, paired in a sweet and savoury multi-coloured harmony. - Heat oil in large skillet on medium heat. - Add shallots, sauté until softened. - Add garlic, salt, thyme and allspice and stir until fragrant. - Add blueberries, water and vinegar. - Mash berries with potato masher and cook until sauce thickens, stir often. - Season with freshly ground black pepper and let cool. - Stir fresh mint into blueberry sauce and sprinkle over barbecued salmon. Frozen yogurt franchises are popping up all over the Lower Mainland and are a big hit among the health and fitness crowd because of its low fat and high protein content. Let's get real: everyone loves a swirly cup of flavoured frozen yogurt so try out this probiotic filled recipe at home. - Combine strawberries, sugar, vodka and lemon juice in a medium bowl and stir to combine. - Cover with plastic wrap and let sit until the mixture is syrupy (about an hour). - Combine strawberry mixture and Greek yogurt in a blender and purée until smooth. - Place a sieve over a medium bowl and strain the frozen yogurt purée into bowl to remove seeds. - Discard seeds, cover bowl with plastic wrap and chill in the freezer until very cold. - Freeze frozen yogurt mixture in ice cream machine according to your model's instructions. - Place in freezer until firm enough to scoop (a few hours). Whether as a sweet salad topper or savoury compote, berries make for a sweet accessory to any meal. Throw away your dated recipe books and toss them into something unexpected. If you still find yourself overloaded with blackberries, blueberries, cherries and strawberries place them on a freezer tray and save them for your favourite Fall recipes. What's your prized berry recipe? Let us know on Facebook, Twitter or Instagram!